Scotland will hold a referendum in 2014 on independence as mandated by the Scottish National Party in its 2011 election platform. This is an edited transcript of the arguments for independence as articulated by the SNP. Some have suggested Scotland’s too small to be independent. Not so. The size or population of a country has nothing to do with its prosperity. Scotland is slightly smaller than Austria and about the same size as the Czech Republic. Of the 193 independent nations represented in the UN, approximately 85 have a population smaller than Scotland’s. Our gross domestic product (GDP), excluding oil and gas production, is approximately £86 billion [C$136 billion]. That’s larger than the economies of New Zealand, Norway, Finland and Ireland. Our diverse economy provides employment for 2.5 million people, and generates an annual output of more than £100 billion [$158 billion]. We have a wealth of natural resources including agriculture and forestry; beef, mutton, lamb, pork and poultry production; dairy products; fishing, fish processing and fish-farming. There are extensive reserves of coal, and sources of iron, zinc, oil-shale and peat. Not to mention glorious mountain scenery and an ample supply of water. As a net exporter of electricity, and with increasing development of wind and wave power, Scotland doesn’t need or want any more nuclear power stations. Meanwhile, Silicon Glen is the name given to our long-established and highly diversified electronics sector. Indeed, Scotland manufactures 28 percent of Europe’s personal computers. And don’t forget whisky exports, which are now worth nearly £3.5 billion [$5.5 billion] with the UK treasury raking off some £1.6 billion [$2.5 billion] in duty each year. We wouldn’t need control but the oil is obviously of huge benefit to Scotland. Approximately 90 percent of the UK’s oil revenues come from the Scottish sector of the continental shelf. In 2008, our offshore natural resources generated an estimated annual output of over £30 billion [$47 billion]. The energy sector directly employs 40,700 people in Scotland, and indirectly supports 195,000 through its supply chain and export activities. Since 1980-81, the UK government has taken more than £242 billion [$381 billion] in tax receipts from the North Sea oil and gas fields. That works out to £48,400 [$76,233] for every person in Scotland. The money has been squandered on things such as the Millennium Dome, yet another Heathrow terminal, the London orbital motorway, the horrendously expensive and unnecessary Trident missile system and military interventions in Iraq and Afghanistan. Vast reserves of oil and gas, worth over £1 trillion [$1.6 trillion], are still to be tapped in the Scottish sector of the North Sea and Atlantic. Some experts say as much as 25 billion barrels remain to be discovered. An independent SNP government would open a sovereign wealth fund based on what Norway (pop. 4.9 million) set up soon after oil was found in its sector. A share of the revenues would be invested in the fund for future generations — so that oil continues to benefit the Scottish economy far into the future. The current parliament has fewer powers to raise and spend its own income than virtually any other legislature in Europe. Less than the Isle of Man, Catalonia, Flanders or the Basque country. Holyrood only has control of a meagre six percent of its finances — mostly raised from council tax and business rates. Scottish government budgets are almost wholly reliant on Westminster whims. Currently, the amounts that Holyrood can spend on vital services like health, education and law and order depend entirely on grudgingly given block grants or pocket money. The London government also sets the level of age pensions and other allowances. Scotland’s growth has remained behind that of the UK in nine out the past 10 years. In 1977-2007, our average annual GDP growth rate was just 2 percent, well behind that of Ireland (5.3 percent), Norway (3.1 percent) and Finland (2.9 percent). With independence, Scotland would manage its own national budget, and enjoy full responsibility for promoting economic growth and improving our competitiveness. We would collect and spend our own taxes, including the revenues from North Sea oil, and would be able to borrow freely in international markets. For decades, Scotland’s economic stagnation and decline have been mainly due to “absentee” administration. London governments, of any hue, have tended to view our country through the wrong end of a telescope, and major decisions on economic planning and investment have been generally designed for the overpopulated south-east of England. An independent Scotland, with full fiscal powers, would obtain control of key elements of the UK’s current economic policy. These include all taxation, financial markets and regulation, monetary policy, inflation targets, foreign exchange and borrowing, company and employment laws, employment rights, immigration, energy policy, competition, corporate insolvency, science and innovation, telecommunications, consumer protection, product and trading standards, health & safety, and social security. A Scottish government would also be able to formulate a more competitive corporation tax to boost the economy through increased foreign investment, research and development, and the siting of major company headquarters. The SNP’s policy is independence in Europe. The party sees the European Union as an institution in which independent countries work together, and not as a forerunner of a federal super-state called the United States of Europe, or similar. It wants national governments to retain control over many key issues, such as their constitutions, taxation and spending. However, to get listened to in Europe you have to be an independent member state, and Scotland would continue to be part of the EU after self-government is achieved. This natural progression is set out in the 1978 Convention on Succession of States, which says: “Any treaty in force at the date of succession (i.e. independence) in respect of the entire territory of the predecessor state continues in force in respect of each successor state so formed.”Although unlikely, it would not be possible for any EU member state to attempt to block Scottish membership. At present, as part of the UK, Scotland only has six members of the European Parliament — the same number as Luxembourg or Malta. As an independent state, this representation would rise to 12 or 13 — equal to Ireland or Denmark. Scotland would be a member of the United Nations, the Commonwealth, the World Health Organization, the OECD and the World Trade Organization. This would enable us to promote our national interests globally and engage with other states as an equal partner. The UK still sees itself as a world power, and Scotland is required to pay its share for continuing pretentious extravagance by the foreign office. Remarkably, even in these economically stringent times, there are still more than £1.1 billion [$1.7 billion] worth of British embassies, offices, residences and land around the world. A nation that governs itself must have the capability to defend itself, and Scotland would probably have defence forces on the scale and model of countries such as Denmark or Norway. These nations are members of NATO and Scotland would also inherit a treaty obligation to the alliance. However, the SNP’s opposition to nuclear weapons would require the phased but complete removal of the massively expensive and militarily unjustifiable Trident missile system from the Clyde. Scotland’s defence would be primarily focused on securing its territory, rather than having the intention or capacity to conduct overseas wars. Scotland currently uses the sterling monetary system, and is unique in Europe in having three different banknote issuers: the Bank of Scotland, Clydesdale and RBS. Bank of England notes are also legal tender north of the border, but sometimes Scottish notes are not accepted in England. Although there is an understandable sentimental attachment to this multi-currency, it is generally thought of as impractical and cumbersome in the 21st Century. An independent Scottish government would have three options: staying with sterling; introducing a new currency (with notes and coinage issued by a central bank); or entering the European Economic and Monetary Union (EMU). The SNP would consider Scotland’s adoption of the Euro, but only if this was first approved in a referendum and economic conditions and entrance requirements were favourable to Scotland’s interests at the time of application. Independence would actually lead to an improved relationship between Scotland and England, in that dealings would be conducted by two sovereign governments on an equal footing. It certainly wouldn’t mean an end to the strong and valuable social ties and friendship which exist between ourselves and the other countries of the British Isles. We will always retain common interests and goals through our shared history, geography and social interchange. It is important to remember that although the political union would end, our social union in these islands would continue as before. Scotland’s biggest trading partner is England and Wales, with trade worth £26.1 billion [$41 billion] in 2007. As a full member of the European Union, Scotland would continue to have access to its markets and, as both Scotland and England would both be in the EU, enjoy complete freedom of movement between the countries, with no customs or passport checks on our borders. Already, no passports are required for those travelling between the UK and Ireland. Like the Scandinavian countries, we would be able to work together in a strong partnership on areas of mutual interest and advantage. The existing joint ministerial committee should serve as a useful model for a new intergovernmental body to manage the new relationship between Scotland and the rest of the UK. The Scottish government already provides representatives and input to the British-Irish Council. Choosing independence in the referendum would be an act of self-determination by the Scottish people. 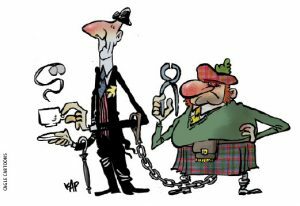 UK governments have indicated, in recent years, that if the Scots decide they want to govern themselves, there would be no impediments to prevent them from doing so. It is expected, therefore, that negotiations between Scottish and UK governments would be conducted in a spirit of cordiality and co-operation. The 1983 Vienna Convention establishes principles for the division of the value of assets during independence negotiations. While independence negotiations were underway, the Scottish parliament would approve the text of a draft constitution. This would be subject to full public scrutiny and debate before being finalized by the parliament, and would become law as soon as an independence settlement had been agreed upon and put into effect. The government and parliament would also be formulating policies for the newly acquired areas for which they would be taking responsibility, and opening a dialogue with the EU and other international bodies. The SNP proposes that there be new elections to the Scottish parliament shortly after independence had been declared. A single-chamber parliament would have fixed four-year terms and its MPs would be elected by proportional representation. The government would be headed by a prime minister, a cabinet and other ministers elected by the parliament, which might be made slightly larger, to take account of its greatly expanded powers. While it is possible that the SNP would form the interim government, it would be up to the democratic will of the electorate as to who would govern the country thereafter. It is envisaged that the three major parties currently under control from London would contest the elections as truly Scottish political parties, committed to national independence. The judicial system would continue in its present form, with an independent legal body appointed by a judicial appointments commission. The UK’s Supreme Court would no longer be a court of appeal in civil cases. Automatic rights of citizenship would be open to all those living in Scotland. The SNP believes that all of our citizens have a valued part to play in our new country, regardless of their place of birth or ethnic background. Those who chose not to take up Scottish citizenship, or opted for dual citizenship, would continue to enjoy an unaffected right to residency in the country. We would also welcome the diverse skills, talents and contributions made by the new Scots who chose to make their home in Scotland. Nearly every country in the world, except the UK, has a written constitution. There are two principal reasons why Scotland requires its own. The first is to define what its Parliament can and can’t do. The second is to guarantee the basic human rights of ordinary citizens, based on international law. The UK doesn’t have a written constitution, other than the grossly undemocratic and discredited 1707 Treaty of Union. This has given the UK Parliament absolute supremacy, with unlimited powers to legislate as it sees fit. Here, the people would be masters of the Scottish constitution, while the executive, legislative and judicial branches of the state would be subordinate to it. The SNP prepared a draft text for a constitution in 1977, revised it in 1990-91 and finally published A Constitution for a Free Scotland in September 2002. In it, the powers of the parliament, government and head of state are clearly defined, and the independence of the judiciary guaranteed.